Transporting rescued pigs comes with far more hurdles and challenges than traveling with a family companion pig. Rescued pigs come from all different backgrounds, sizes, some are intact, they may not be harness trained, they may not be comfortable in vehicles, they may be fearful of people, they may be terrified of crates, they may be aggressive to strangers, or they may bolt at the first chance. PREPARE AHEAD: Make preparations before traveling is necessary. 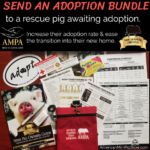 Make sure you have an appropriate sized crate to fit a variety of sized pigs, proper paperwork, first aid kit, any other supplies, contact numbers to other rescuers or veterinarians in case of emergency…. Consider specifics to your situation and get as much in order as possible. This will make the actual transport more smooth and worry free, because when a pig is in need of rescue it tends to be GO, Go, GO! RESEARCH TRAVEL LAWS: Travel laws vary by state. Some states have laws regarding pet travel within the state. All states regulate the movement of swine across state lines. Ensure you know the laws for any states you will be entering. For more on Interstate Travel Laws click here. IDENTIFICATION: Ensure the pig is microchipped and registered. In case the pig is lost or escapes during transport, this microchip will be a lifeline back if he is found or gets picked up by animal control. If the pig is harness trained, an ID tag with contact information can be attached to the harness. 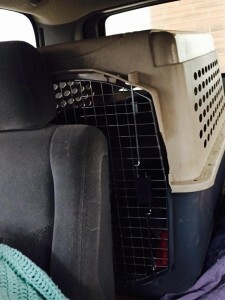 If traveling in a crate, a Pet Travel Card can be attached to the crate. or is in a crash, the crate or kennel door can pop open. A bungee cord can be wrapped across the front of the crate or kennel to keep the door safely closed. If the pig is allowed to ride in the vehicle without a crate he should be restrained by a pet approved vehicle restraint system (pet seat belts) or a leash tied to the seat. This will prevent the pig from leaping out of the car when a door is opened. When possible, position the crate door against a seat to help keep the crate safely closed. TEMPERATURE: Keep pigs at a comfortable temperature. In cold, offer blankets to burrow. In heat, freeze 2-liter bottles to lay in the bedding and offer plenty of water breaks. PAPERWORK: When traveling across states lines, ensure all paperwork is in order to follow applicable laws. Health Certificate or Certificate or Veterinary Inspection (CVI) are often required traveling across state lines. Health records, blood test results, or vaccination records may be required depending on local laws. If the pig has been surrendered to a rescue organization, keep a signed copy of the Surrender Form on hand to prove ownership. A travel first aid kit should be kept in the vehicle at all times. For ideas on making your own travel kit (LINK – Emergency Travel Kit) or purchase an AMPA First Aid Kit – Coming Soon!